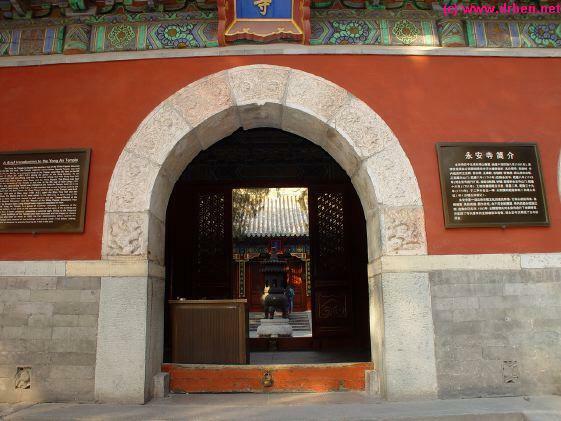 After passing under the Traditional Arch that marks a Chinese Temple we arrive at the Yong An Temples Main Gate, at the South-side and foot of the Jade Island Hill. The extensive Yong An Temple complex awaits. 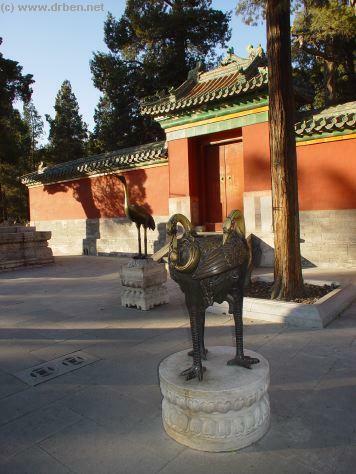 First built in the period around 1651 AD and the visit of the Dalai Lama , the Temple complex was renamed Yong An Temple and extended considerably during the reign of Ching Emperor Qianlong leaving a multitude of platforms, shrines, beautifully decorated and furnitured halls and other relics. 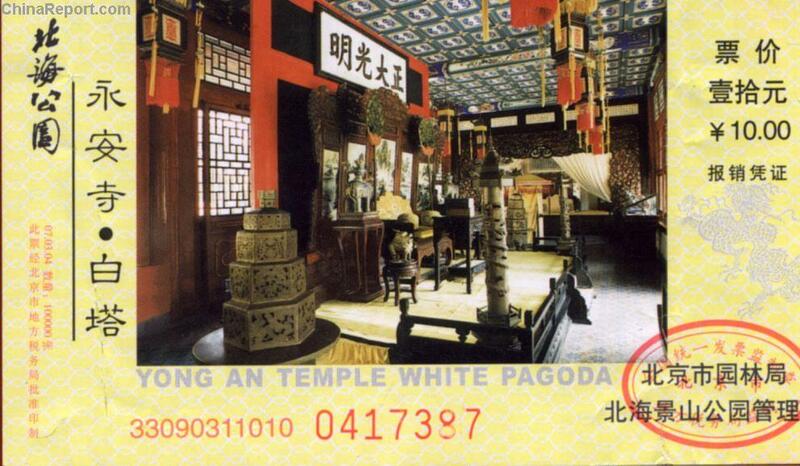 The entire Island and Yong An Temple are a Fine example of ( late ) Ming Dynasty Architecture and design. The Jade Island was left in much the same State and layout eversince the reign of Qianlong leaving a multitude of Shrines, Halls and pavillions awaiting us. Our digital Tour takes us all the way through Yong An temple, up the 34 meter high Hill to the Bai Ta or White Dagoba. Bronze Statues of mythical animals decorating Yong An Temple Gate. Mythical Bixi tortoises and the ever Royal Crane Bird. Walkways go left and right around the Island from Here. A Plaque at the Yong An Temple Gate with a historical description of the Temple Complex. As mentioned Emperor Qianlong was the Last Emperor to really extend and redevise the entire Park and Temple , adding several buildings. The plaque mentions the added Gate in front of which we find ourselves. Behind it are a courtyard holding two towers. Both were added later during Qianlongs reign to complete the Temple. In earlier Times the Zheng Jiao Hall ( now on the 1st level) had been the direct entrance into the Temple. 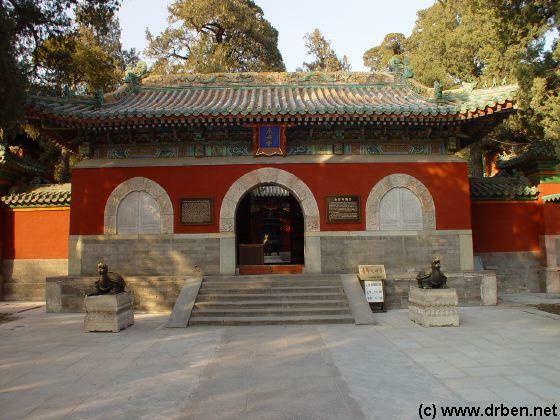 As Jade Island was Qianlongs favorite playgarden and family pride he completed the Temple with all the buildings, Gates and Towers associated with a traditional Chinese Temple. 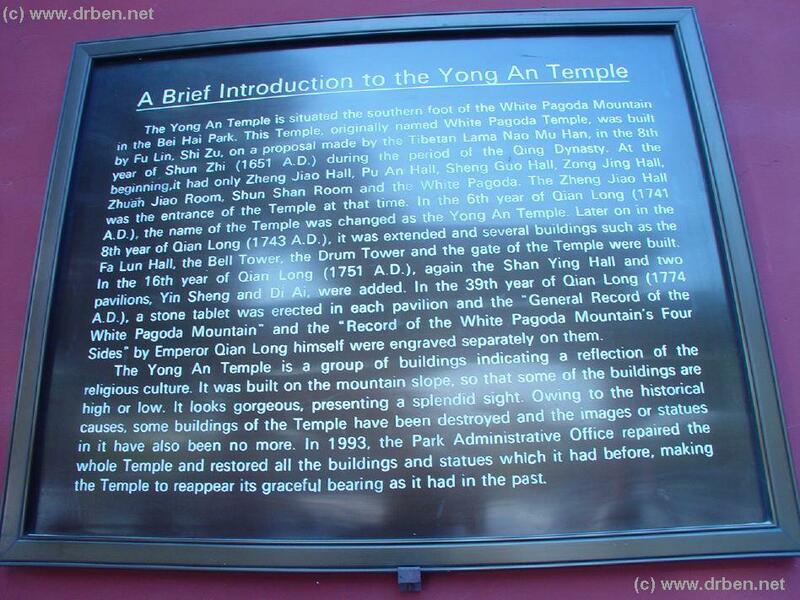 As mentioned the lower part of the Chinese Lamaist Yong An Temple is was initially formed by Zheng Jiao Hall. Now there is a Gate and Courtyard, followed by the colorful Fa Lun Hall. 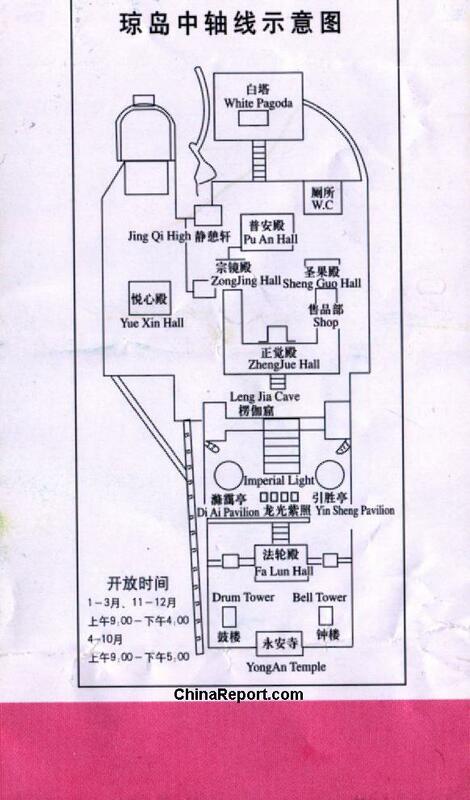 The Zheng Jiao Hall is found at the Hill Temple's first level.